It’s a clear, warm Sunday morning in Portland. Sandy Boulevard is nearly deserted and Tom Haig is cruising on his bicycle. He tucks into the teardrop position, thinking, This is awesome. Suddenly, an elderly couple blow through a stop sign. Haig reacts quickly—but he’s pissed and, looking back at them, yells something unprintable. A second later, he returns his attention to his direction of travel. Yellow light! And a truck coming at him. Bicyclist and driver lock eyes. Both brake and Haig thinks, I’ve got this. That truck has enough clearance for me to lay it down and slide right under. Twenty-some years later, Haig has arms like tree trunks. His humor is infectious, his laughter raucous, and his spirit indomitable. The athlete, musician, videographer, and broadcast professional never stopped or even slowed down because of his paralysis. He maneuvers his wheelchair like a fine-tuned driving machine. Which made going to broadcast school in Pullman interesting. In January 2007, when Haig arrived for the spring semester, it was pretty typical snow, freezing rain, ice storms, and wind chill. And, notoriously, everything was uphill both ways. “I’d been warned by friends that Pullman was like San Francisco. But I’ve lived in the Himalayas. How hard can it be? But when I was in the Himalayas it was summer time. And this was ice and I was like, Oh my god, how am I going to get around? It was just paralyzing,” guffawing at his own pun. Haig managed, and found the folks in his communications program at the Edward R. Murrow School of Communication warm and welcoming. “They made the Cable 8 studio accessible,” he says. After graduation, Haig got a note from his brother, Dan: the Dalai Lama’s Tibetan government-in-exile was looking for someone able to run a small community radio station. Haig raised his hand and got the gig. After the 2015 Nepal earthquake that killed some 9,000 people, the world traveler was back in the Himalayas. His mission this time was to produce occupational therapy training videos for distribution across the country. “It’s a five-day trip to get to the far end of the country,” he says, but the clinics there, with their patients in wheelchairs, badly needed current-practices information. The quake injured 22,000 people. One physician Haig met, Raju Dhakal, said his rehabilitation facility went from 30 patients to over 100 in a single day. 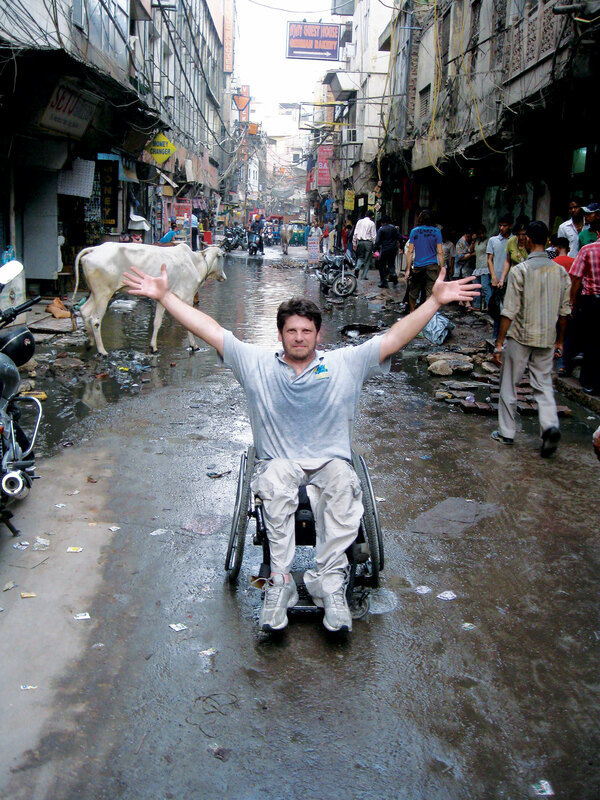 Haig has become an expert on disability culture. He’s done videos on French disability sports. He was alarmed by what he saw in Albania, where people in wheelchairs were largely ignored. In Ghana he was delighted to find one of the most advanced disability cultures he’s ever seen.